While the country was captivated on election night by insurgent campaigns led by Southerners like Andrew Gillum, Stacey Abrams, and Beto O’Rourke, people in the America’s Heartland and the Rustbelt were preparing a message of their own. Two years after they sent Donald Trump to the White House, voters in the Heartland broadly rejected his divisive agenda in a people-powered blue wave. Democratic gubernatorial wins in Michigan, Wisconsin, Kansas, Pennsylvania and Illinois were a rebuke of Trump’s racist rhetoric and of candidates who emulate him, and the victories didn’t stop there. In deep-red Iowa, where Republicans controlled three of four Congressional seats, Democrats now control three of four. Eight of the U.S. House seats that flipped from red to blue were in the Midwest. Michigan and Minnesota chose Muslim women to represent them, and Kansas chose Sharice Davids, an openly gay Native American woman. Wisconsin’s new Lieutenant Governor, Mandela Barnes, will be the first black lieutenant governor of America’s Dairyland. Together with Governor-elect Tony Evers, he will be a strong advocate for quality public education and access to affordable health care. Kansas voters shut down Secretary of State Kris Kobach’s anti-immigrant bid to become governor, and chose Democrat Laura Kelly to lead the state. There were also important down-ballot wins. 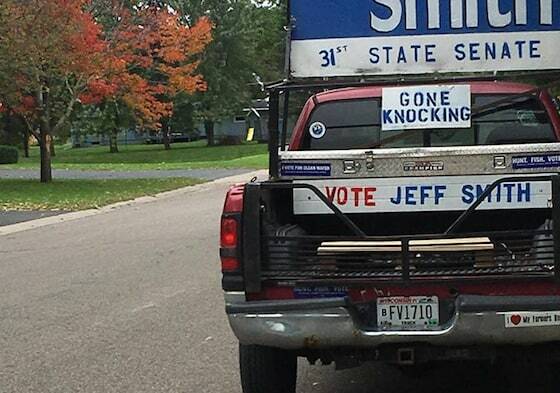 Jeff Smith, a progressive community organizer and another Citizen Action of Wisconsin member, won a state senate seat in his rural district. He ran on an all-out populist platform calling for a public option on health care, reining in corporate agriculture, protecting the environment, and a statewide living wage. In Minnesota, Angela Conley, who was inspired to to run for Hennepin County Commissioner at a TakeAction Minnesota training, ran with a commitment to advance progressive solutions to Hennepin’s homeless crisis. She will be the first African-American to oversee the $2.4 billion budget of the state’s largest county. The strength of Democrats’ so-called “Blue Wall,” which for decades united farmers and urban union members across the Midwest, came into question after the Tea Party’s assault on the region in 2010 and Trump’s 2016 electoral college victories in Ohio, Iowa, Wisconsin, Pennsylvania and Michigan. Yet these same states helped send President Obama to the White House twice, in some places by margins as high as 9 percent. An incredible 31 of Iowa’s 99 counties swung from Obama to Trump. Twenty of Wisconsin’s 72 counties followed this trend. But as midterm results show, voting for Obama was not an aberration for many of these counties – voting for Trump was. Most have been fairly dependable Democratic strongholds – voting Democrat in most presidential elections, with the exception of Nixon’s landslide in 1972, and Reagan’s trouncing of Carter in 1980. In this midterm, a critical swing ran along the Mississippi River on the Iowa and Wisconsin borders. The greatest concentration of the much-discussed “Obama-to-Trump” pivot counties is here. Many of these rural areas have now swung back. Nearly all of them gave up Trump’s double-digit gains from 2016. In Iowa, even though J.D. Scholten fell short of unseating white supremacist Steve King, he posted one of the night’s largest gains for Democrats: 23.4 percent. The night’s largest gains for Democrats – more than thirty percentage points – came in West Virginia, Minnesota and Illinois. Some coastal progressives were ready to write off “flyover country.” But People’s Action, where I am the director, and our member organizations in the heart of the country — knew we have to double down. We dug into the work of building deeper relationships with rural people who are rarely asked for their opinions and whose voices are rarely counted. We heard their pain as jobs, farms and hope were lost. And we’re not done yet. We have shown how by building solidarity with their neighbors, rural communities can fight together and regain their power and their voice. Wherever Republicans have gained ground by stoking hatred and fear, we are building bridges of understanding. Out of the rubble of the old Blue Wall, a multiracial coalition is rising across the Midwest and Rustbelt. Rural and urban people are coming together around bread-and-butter issues like health care, clean water and clean air, quality housing, education and living wages. Meaningful victories aren’t won in a day. Votes, hearts and minds are changed one conversation at a time. People’s Action is committed to our communities for the long haul. Trump slipped into the White House on a combined 80,000 votes from Michigan, Wisconsin and Pennsylvania. He won each of these states by roughly 1 percent. Hillary Clinton never made a stop in Wisconsin, taking the people there for granted. She was the first major party nominee to not campaign in the state since 1972. She lost by 27,000 votes. The fact that so many voters in of these Obama-to-Trump counties swung back to blue two years later gives us hope as we now look towards 2020. It offers a clear path that will help us send Trump packing as a one-term president.